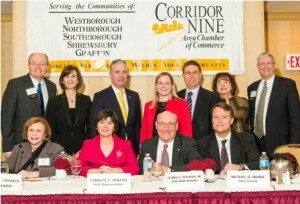 Legislators pose with Corridor Nine Area Chamber of Commerce officials after the annual breakfast. Westborough – The battle over minimum wage, the increasing problem of homeless families being sheltered in local hotels and how to better support businesses were all topics that were on the agenda at the Corridor Nine Area Chamber of Commerce Legislative Breakfast held Jan. 28 at the Doubletree Hotel. Over 200 members of the chamber attended the annual breakfast, which featured a panel of local state senators and representatives discussing the pressing issues facing the state. Paul Matthews, the executive director of the 495/MetroWest ?Partnership, ?moderated a discussion that included state senators Harriette Chandler, D – Worcester, 1st District and Michael Moore, D-Millbury, and state representatives Carolyn Dykema, D-Holliston, George Peterson Jr., R-Grafton, Matthew Beaton, R-Shrewsbury, Danielle Gregoire, ?D? Marlborough and Harold Naughton, D- Clinton. Chandler said she is in favor of a proposal to raise the minimum wage in Massachusetts from the current $8 to $11 by 2016. Peterson noted that while he is in favor of an increase, it should not be tied to “an automatic trigger” such as the inflation index. Rather, he said, it should be tied to unemployment benefits. “So many people are just trying to make ends meet,” she said. Beaton added that he too supports the increase but feels there should be an exemption for teens ages 14-19. 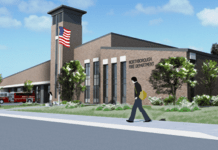 Tied into that discussion, the legislator&apos;s all agreed, was the need for better training programs that would benefit the state&apos;s businesses and those seeking jobs. The issue of homeless families being sheltered in local hotels was a very difficult problem, the legislators all agreed. Currently 2,000 families are living in hotels across the state, including some in Northborough, Shrewsbury and Marlborough. Naughton noted that the state had faced a similar situation in the 1980s and had successfully dealt with it, until the recession hit several years ago. A lack of transportation was also a critical component of the problem, he added. The legislators also stressed the need for state government to be more supportive of businesses in order help grow the economy and create job growth as opposed to trying to implement such things as the Tech Tax which was defeated last fall. “We can&apos;s place undue pressures on businesses [to pay additional taxes] to balance the [state&apos;s] budget,” Peterson said. “If we have a strong economy we will have all the money we need to balance the budget,” he added. The legislators also thanked Barbara Clifford, the outgoing president of the Corridor Nine chamber, for her years of helping to support over the past 11 years in helping local businesses. 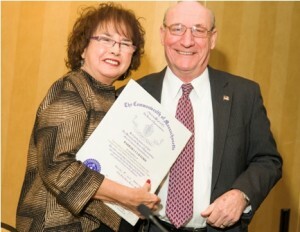 She was presented with a citation from the state Senate and House of Representatives. Clifford will be retiring in April and will be succeeded by Karen Chapman, the chamber&apos;s current vice president. Barbara Clifford, president of Corridor Nine, accepts a certificate of appreciation from state Rep. George Peterson Jr., R-Grafton.